New Kids Riding Group- The ATL KID GOAT RIDERS! 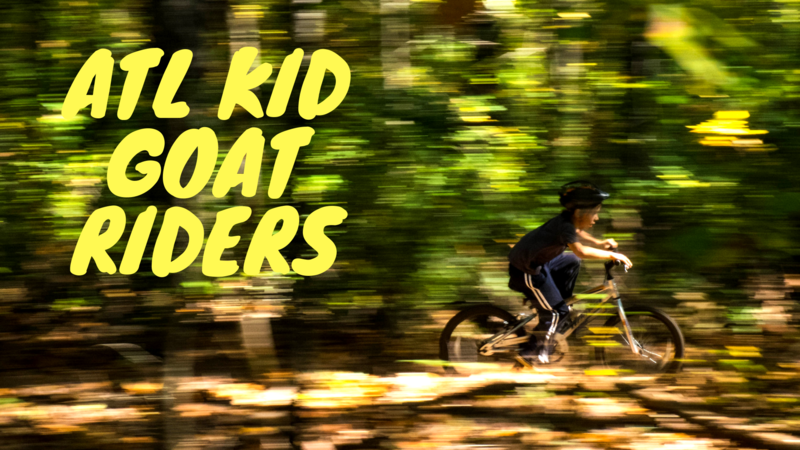 MTB Atlanta is launching a new group ride series and corresponding social group for kids and parents who want to ride together called the ATL KID GOAT RIDERS. This group was inspired by a local mom and her son who wanted to know if there were any groups for kids to ride trails in Atlanta. We didn’t know of any and she stepped up to run the first ride! Her son came up with the great name for the new group. These rides are made for young children and their parents to have fun and gain experience riding dirt trails together. Our first ride will be held on the Evergreen Trail at Southside Park on November 11th at 12 P.M.
A mountain bike and helmet is required, all children must be accompanied by one of their parents on the trail and a waiver must be signed. After all those requirements are met, fun will be held by all! The Evergreen Trail is a mile and a quarter beginner loop that is ideal for kids and beginners. If you are not on Facebook follow along here and our Events calendar. If you have any questions reach out to sorbabrett@gmail.com .